Every day of the week different events are organised and take place throughout the United Kingdom and the appropriate Liability Insurance is essential to protect all those involved in the organisation and running of such events not forgetting the millions of people attending as spectators. As we all know we live in a litigious age and with No Win No Fee companies advertising almost everywhere there is a greater than ever chance you could become embroiled in legal action at some point in time, the need for this comprehensive Liability Insurance cover is essential to ensure peace of mind. It does NOT matter whether the attendance is 50 or 50,000 WE can help. Currently we are able to offer the most competitive cover in the UK and in the majority of cases terms can be produced immediately. Even when we need to discuss your specific requirements with our Underwriters Terms and Conditions will be provided within 72 hours. We will look to provide you with the relevant cover at premiums your Event can afford – We GUARANTEE that you will sleep easier. 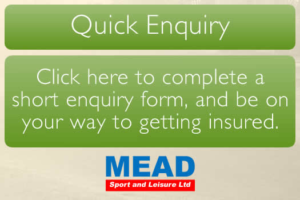 © Mead Sports and Leisure Insurance 2019.